Hiring a blog writing service is right for you if you want to grow your website traffic while making the most effective use of your time and resources. A blog writing service offers you a helping hand or a set of helping hands that will give you a competitive advantage, making it easier for you to achieve your business goals. What is a Blog Writing Service? A blog writing service is a team of writing professionals that can handle the content writing needs of a business. One of the best ways to illustrate why more and more businesses are getting more serious about their blog content is to look at some statistics. Now that you are aware of some of the numbers involved in improving your business’s reach and profitability via blogging, let’s look at some of the specific ways in which this will happen. Build authority in your industry – If you can provide solutions to people’s problems online through a blog, you improve your business’s reputation. If you have some interesting ideas about your industry and you are a forward-thinker, even better. Getting some of those ideas on screen via a solid content strategy is a great way to augment your credibility and standing within your industry. Each blog post is an SEO opportunity – Many businesses create a few SEO-rich pages for their site (such as About Us, Contact Us, Pricing) and leave it at that. Regular blog content, however, provides the opportunity for more SEO optimization, including the natural use of more long-tail keywords which search engines love. Provide fuel for your Social Media Marketing – One of the great things about blog content is that each blog post can be repurposed for different venues. One blog post topic can generate multiple items of content tailored to each of your social media platforms. You’d be unlikely to post the exact same content to Instagram and Medium, for example, as the expectations from their users are very different. Use blog content to ping your email marketing list – Having new high quality blog content gives you a great reason to get in touch with your subscribers. It’s the difference between turning up at someone’s door asking for a favor and turning up at the same door with a wrapped gift. Which approach would make regular visits more welcome? You get sales material – Growing your content is growing your business. You increase your presence online and you increase the wealth of your marketing and sales material as well as other useful information for your current and future customers. Content is a great resource for your sales team. They can use it to keep their tone and message cohesive with the brand. They can direct your target audience to the information to help them make decisions. It helps with each phase of the Buyers Journey – By creating content to match the steps of the buyer’s journey, you can aid your visitors as they move towards making a purchase, wherever they are in that process. Your content can act as a charming, authentic salesperson who happens to work 24/7/365 and can serve multiple visitors at once. If you don’t have the expertise to write a blog, you can learn the essentials and develop your skills from there. If you don’t have the time to spare, however, or you would rather focus on other areas of your business, you could hire a blog writing service. Let’s have a look at some of the advantages of working with a professional writing team. They already have blogging experience – If time is of the essence – for most businesses, it is – you want to hit the ground running. A professional blog writing service has the people in place and the expertise required to turn your vision into reality fast. For a blog writing service, SEO-optimized pages, customer-focus, and creating writing that flows are second nature and a number one priority. You only pay for the content you need – the way it works with most blog writing services is that you discuss your needs upfront in terms of topics, types of content, and the number of words required. Then the service will deliver what you’re expecting. With transparency and you in control, there should be no unpleasant surprises, financially or otherwise. Businesses that opt for hiring a blog writing team in-house, need to consider the salaries paid to individual professionals. An in-house content writer can charge you in the region of $60,000 per year, while an editor might set you back over $45,000 per year. Want an SEO Specialist on your team? Make room in your budget for $65,000 each year. These figures are just three of the reasons many businesses choose to work with a blog writing service rather than creating their own in-house team. You can focus on what you do best while they write you blog content – Another reason to work with a professional blog writing team is a popular one; they take care of your blog posts so you don’t have to. Throw a few ideas their way and they will spin those threads into gold. In the meantime, you can continue tweaking your content strategy, working on a new product or developing your service, or perhaps you just want to spend more time with your family. Wherever you want to put your resources, you can keep doing so when a professional writing team is looking after your content and, therefore, your customers. 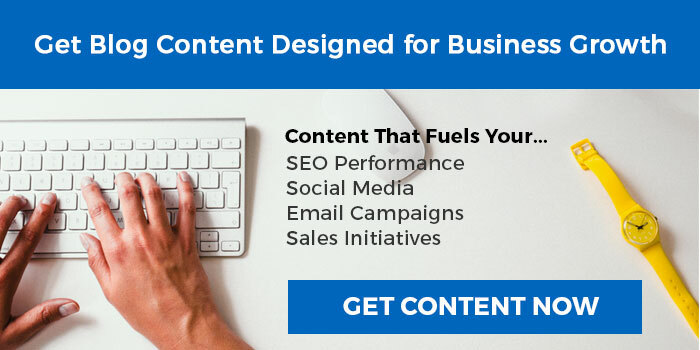 They can provide you with content marketing guidance – Nobody is born knowing how to create content for every customer or client in every industry. A professional blog writing firm has the shared expertise, however, to meet most challenges an industry may pose. And you can ask the team for advice. They are the perfect people to help you make the most of your content opportunities. They can get you a writer with experience writing for your industry – Whatever your industry, there is a good chance that a copywriting team will have the resources or the connections to match your needs to the right writer. Consider this scenario. You are hungry, but you can only eat a particular kind of fish. Do you stand at the edge of a river with a stick you sharpened earlier, or do you get help from the fishing vessel that is throwing nets into the best part of the ocean? Finding the ideal content writer in terms of technical knowledge can be challenging. Making sure that this writer also suits your needs stylistically is an added challenge. The networks made by a professional blog writing service can improve your chances of getting the person you need. More resources than a freelance writer – What’s better than access to a top-notch writer for your content. Access to ten or twenty top-notch writers. If you are looking at producing significant amounts of content and diverse content types or topics, you will benefit from working with a team with varied, deep resources. A team will be more likely to be able to meet your needs dynamically than an individual writer. And working with a team might save you from re-entering the hiring process every time you want something a little out of one writer’s comfort zone or area of expertise. How to choose the best blog writing service for you? As you can see, it’s not so much a question of whether or not your business should be blogging, but how much you should be blogging and how to get it done without taking up your time and resources. Choosing a blog writing service from the many services available can be very challenging, unless you are reading this blog post, in which case, you can follow these three tips to make an effective short list of possible agencies. Decide on a budget – How much can you spend on your content writing? How much of that can you spend without wincing? Remember that the ROI on great content is very good – your blog posts can become salespeople and business representatives that work around the clock for you, attracting increasing numbers over time. Once you have set a workable budget, you may be able to eliminate some agencies from your consideration. An in-house writer can cost your business 60,000 per year. Outsourcing to a team should be significantly more affordable. Determine what features are important to you – Since you’ve read this far, you’ll know that there are many good reasons to have an active blog on your business website; it’s time to decide which of those benefits align with your goals. Decide on your goals and what you need from an agency to fulfill them. While one business might prioritize speed and ease of use, another might focus on industry expertize and the availability of market advice. Knowing your needs and being able to articulate them will help you narrow your search. Decide who at your organization will be your point of contact – It’s good practice to have a dedicated person or people to communicate with the blog writing service. This helps minimize the possibility of crossed wires and potentially slowing down the content creation process. Ideally, your point of contact will have some marketing knowledge. They should certainly be a good communicator, whether orally or in writing, to convey the business’s needs and objectives to the writing service. Make sure your web/marketing team is aware of the incoming content – While a beautifully written blog post might be a nice surprise for some of your visitors, don’t make it a surprise for your web or marketing team. They should be aware of incoming content so that they can react to it quickly, get it online, and help maximize its reach. Most businesses would benefit from doing more than warning their web and marketing teams. Getting them involved in the content creation process, such as by suggesting topics to cover, identifying customer needs, and considering the capabilities of the web server(s), would be a great use of their expertise. Can I See Examples Of Your Work? - This is a time saver. No matter what the service claims, the quality of its writing will speak for itself. Ask for an example of the service’s work, relevant to your industry, and you’ll be able to gauge whether or not you can work with them. Elements of style and tone can be tweaked. Clunky writing, frequent grammatical errors, and factual inaccuracies, however, are warning flags. Who Is Writing My Content? - The service should be able to tell you which writer or writers are working on your content. While they may not wish to identify them by name, it could be useful if they give you the option to work with the same content writer regularly or to avoid a particular writer if they do not suit your needs. Who Owns The Rights To The Content? - You may consider it standard practice for your business to have the rights to content created on your behalf, but this may not always be the case. The writing service you choose should be transparent about rights when you ask them. What Is The Typical Turnaround Time? - Many variables can affect turnaround time, but an experienced writing firm should be able to give you an estimate based on experience. What Do You Need From Me? - This is a great question, because it prompts the writing service to get started and it demonstrates that you are willing to provide anything necessary to help the team do the best job possible for you. What If I Want Revisions/a Refund? - This is a good question to ask before you engage with any writing service. While, ideally, your content will be perfect first time, it will be good if everyone agrees on the procedure for when things don’t go to plan. Will the firm charge extra for an edit or are revisions included in the fee? How many revisions are allowed? And if the team talks about minor and major revisions, it’s a good idea to clarify what these terms mean. Definitions may vary from service to service. Do You Write With SEO In Mind? - SEO optimized content is very important for boosting your website traffic and generating good quality leads for your business. It will be of great benefit if someone is taking care of your SEO needs. Find out how much of this the writing team will do and how much research you may need to provide. Do You Have Industry Experience? - While a good writer can make almost any topic sound good, specific industry experience can take a good blog post and give it an edge that makes it stand out. This is just the kind of thing you want when competing for position on Google’s search pages. A professional writing team with a range of resources available might be just what you need to make this happen. What Is Your Pricing Structure? - Again, transparency from your blog writing service is key here. One of the major benefits of working with a writing service is that you only pay for what you need. Make sure that there are no hidden costs and that you understand the firm’s pricing structure so you can make the most of this benefit. If a business person you know is thinking about creating content to boost traffic, they are in the process of having a good idea. You can help them make that idea great by sharing this post with them. Then they too will know how and why to hire a blog writing service to do the heavy lifting. If you’re ready to boost your traffic but you don’t want to be tied to your computer for the foreseeable future, get in touch with our blog writing service which we call Blog Hands. Our team of talented, reputable professionals will keep your business moving toward success.